glad she started putting up videos again. good thing shes a pretty laid back person it would seem because theres been a random person asking her to try on clothes from before she got pregnant in her last 2 videos. she has a new video out. bare belly shot @ 2:54. 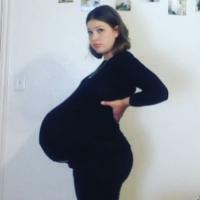 Might want to check out her newest video trying on pre-pregnancy clothes. She's quite large and is laughing at how poorly they fit. That is, if you like this kind of thing. I'm not sure what happened. Suddenly after an apparently long time, she is posting stuff like this. ??? I agree, her last vid is great. I saved both 720p and 1080p versions just in case some knucklehead(s) ruins it for us.